Pocket knives are not all created equal, contrary to popular belief. Because they vary greatly in quality and design, the potential user should consider buying one that meets the needs of its intended usage. Good quality knives tend to cost more than cheaply made ones, but justify the extra expense in the long term. A knife’s brand is extremely important. Name brand knives perform better, have more safety features and last longer. Most brand name knives carry a replacement warranty and offer valuable customer service. Because some of the better brand knives have lifetime guarantees, paying a little more for the best pocket knife may actually save money if any problem occurs. It pays to investigate the reputation of various knife manufacturers and their products before making a final buying decision. Whether the knife will be used for hunting, on-the-job tasks, for just carrying in the pocket for various jobs or a number of other reasons, the intended use should dictate the type of knife required. Many brand-name knives offer high quality at affordable prices, but differ in performance, cost effectiveness and durability. They are a young company, but they produce some great knives. Founded in Idaho in 2014, they have made a splash onto the knife scene, particularly with their Patriot model of pocket knife. This high-end knife manufacturer is based in Oregon. This company produces all its pocket knives in America at their Oregon facility. Benchmade strives to offer the best knives made with top-quality steel. Benchmade pocket knives offer many safety features including patented locks and secure clips. They offer knife owners the opportunity to send in their knives for sharpening and a thorough inspection for as long as they own the knife. This Golden, Colorado company prides itself on its innovative, knife technology. 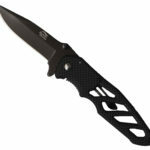 It specializes in producing the best folding knives. One remarkable feature of a Spyderco knife is the easy opening operation that only requires one thumb. This ergonomic feature protects the user from injury. Gerber Legendary Blades is a knife manufacturer located in Tigard, Oregon. The Gerber pocket knife is a versatile knife used most often by hunters, fishermen and other outdoor enthusiasts. These knives are small, portable and lightweight. They work well for almost any everyday task. 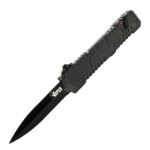 This general-purpose knife features a sharp working blade and a strong handle. Its safe and secure lock makes it perfect for everyday use. Buck Knives are manufactured in Post Falls, Idaho and are recognized as some of the leading sport and field knives. Knives made by other manufacturers are sometimes referred to as a “buck knife” because of the enduring reputation of this American knife company that dates back to 1902. Buck Knives offer a lifetime warranty that allows buyers to register their knives and receive a replacement for free if it breaks or chips. Kershaw knives are popular pocket knives that are used by hunters and other outdoor sportsmen because of the innovative technology used in their manufacture. These knives are known for their precision blades that are always sharp. They feature a torsion bar that makes them easy to open. They perform well for almost any demanding task due to their high-quality construction. They are well-known for their durability and top performance. When choosing a pocket knife, it is important to consider the knife’s construction and steel. High-grade steel blades make a difference in a knife’s quality and performance. 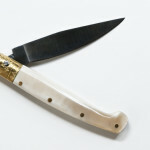 Purchasing a knife from a well-known knife manufacture offers many benefits and advantages that cannot be overstated. The best pocket knife is the one that performs the best when used for a specific purpose. Although many name-brand knives can be used for a variety of different jobs, it is a completely subjective decision for the user. Knives with better quality steel construction are resistant to rust and stronger than those made of lower-grade steel. Durability and reliability found in high-quality pocket knives are two benefits to consider when searching for the best pocket knife. Even though name-brand knives are more expensive than many available cheaper brands on the market, they provide dependable quality designed to provide years of use. Because pocket knives are designed to be carried every day, they must be able to withstand a certain amount of wear and tear. This is another important consideration when choosing the best knife for the job. The best knife does make a difference.